En-JOY these great POSITIVITY and PERSONAL DEVELOPMENT BOOKS! Click on the picture to learn more and make your purchase. These books are sold through CreateSpace and Amazon as HARD COPIES and will be conveniently shipped directly to you from the warehouse. Please follow the link to the book you are interested in or go to Amazon and SEARCH for the books through their website. In this personal development book you’re going to discover 37 easy-to-use ways of activating positivity every day to reap the MANY VALUABLE rewards. Click here to purchase your copy today! Use positive emotions to expand your thinking and doing. Develop the power tools you need for a flowing work life balance. Feel more engaged with increased confidence and motivation. Change things that aren’t working to reach your target goal. Activate positivity every day for overall health and well-being. If you’re a business owner, head honcho of a company or part of an HR team you’ll be absolutely delighted with these helpful tips and strategies to enliven the business or organisation. In fact, this book has many ideas for everyone – for both personal and business use. Allow each positivity injection to enliven your imagination. Change them to fit your unique situation. This book is asking you to step outside the norm and give up the notion that professionalism and productivity must be serious all the time. In fact, as you’ll see, there is much evidence to proven you’re seriously wrong. This personal development book is based on many studies in positive psychology – the study of human flourishing. 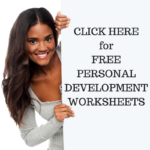 Dive into your personal development journey with The Ultimate Personal Development Workbook by clicking here and purchasing your copy today! Everyone can make the conscious choice to create a peaceful and loving world. You’ll find this personal development book enlightening and intriguing as you experience new ways of seeing what we, as a team of human beings, can co-create on this planet. Purchase your copy of “Healing the Planet from Within” today! You’re a powerful woman and there’s nothing stopping you from creating success in life and business. Arg! But there’s the bloody moon cycle and it has a strong influence on your body, mind and soul. You’ll be delightfully surprised with 37 quirky yet clever ideas used by women worldwide to wield their menstrual power to their success. This little book was written on a whim and is not to be taken seriously. This book has a humorous play on words with witty and clever ideas on how to be successful during the challenging woes of menstruation. The information in this book may or may not be true. Scientific evidence is either limited or changing. As always it is up to you, the reader, to seek the ultimate truth. Honour yourself. Everyone suffers from the same self-doubt, “What can one person do to fix the world’s problems?” Carmen Wyld offers a solution of how to help the planet in her book, Healing the Planet from Within. Her book gives the reader methods for reaching a balance with his or her own life by conscious critical awareness. It is only by healing oneself that a person can start on the process of healing the planet. And one person has a multitude of connections to the community, which in turn has multiple connections to the whole world. By taking this holistic view, Ms Wyld offers hope for both self-improvement and the creation of a healthier worldwide community. This isn’t a book that just offers platitudes. The book abounds with easy to follow techniques for understanding and improving every aspect within the reader’s life, from health and relationships to personal goal setting. Each chapter in Healing the Planet from Within focuses on making small changes that will eventually add up to a major transformation in attitudes and beliefs that will help save our world. Take as an example Chapter Ten ‘Shifting the Nature of Reality’; there are procedures for identifying negative and positive core beliefs, with the goal of discovering which beliefs help or hinder personal growth. As well as writing this book, Carmen offers life design, counselling, and personal development sessions, conducts workshops, hosts webinars and is a dynamic presenter. Inspiring conscious living is the work of many years of study and life experience, shared with the reader with the goal of encouraging readers to obtain a happy and fulfilling life balance. Self-doubt can be replaced by hope and confidence. The answer to the questions of how to save the world and how to help the planet has finally been answered. Carmen Wyld has written a book, Healing the Planet from Within, which is of inner work that reflects the development of our times. She is one of an increasing number of people who see the salvation of our world in the inner work of individuals. Healing the Planet from Within is a simply written movement through many of the areas of conscious life. From chapters beginning with the notion of observing the deep inside and a call to wake up from the addictions of modern life and the mind games of the cultural matrix, through the power of feeling intelligence and imagination. Carmen takes the reader’s heart’s desire and true connection to becoming aware of each person’s energy patterns. She goes on to delineate what she refers to as society’s constructs and leads the reader to the movement of critical thinking and shifting the nature of reality internally. I had the very great pleasure of connecting often with Carmen while she was writing this book and know first-hand how much she desires human beings to fully recognise, not only the Earth day and Earth’s natural resources, but also to come into alignment with one another and with Spirit and the land to unite as a conscious earth-wide community. “We have been living in a false reality where, what we perceive is the ‘real’ world is secluded and synthetic. As a team of consciously aware human beings in an Earth-wide community we can make the choice to exist in balance and harmony with the Earth, its inhabitants and each other. . . . . It is time to let go of our self-serving individualistic ways and work towards a common goal of global consciousness.” – Carmen Wyld. I am sure that this book, Healing the Planet from Within, will bring things together for a lot of people to save the Earth. Her book will make clear to many the relationship of our connectedness to each other and the Earth.